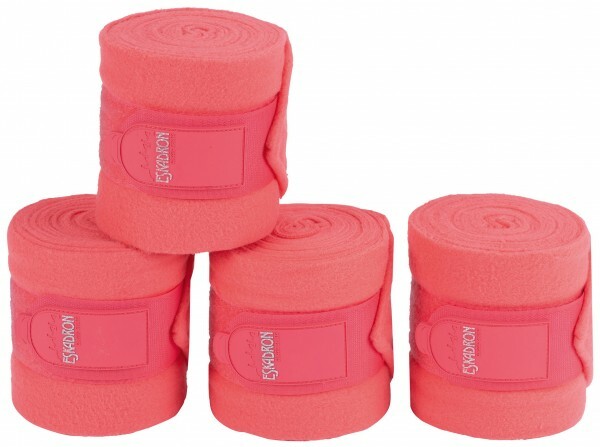 Beautiful quality fleece bandages. The bandages have a length of 3,5 meters and are 10 cm wide. Equipped with a velcro closure with shiny Eskadron logo. Packed per 4 in a handy carrying bag. Available in the colour fusion coral. Luxury saddle pad with glossy outer fabric, Eskadron logo and moisture wicking lining. Available in the colour fusion coral. Strong bell boots made of nylon with a soft faux fur trim and neoprene lining. Available in the colour fusion coral. Luxury saddle pad of cotton with double cord piping and moisture wicking lining. Available in the colour fusion coral. Practical and trendy bag with many storage compartments. Ideal for on competition. Available in the colour fusion coral. Luxury headcollar of Eskadron covered with glossy and with a matching rope. Available in the colour fusion coral.